Sharing the warmth of your eternal love with your forever friends and family is unbeatable. It sent my husband and I off into our next chapter with so much good energy, love and support. 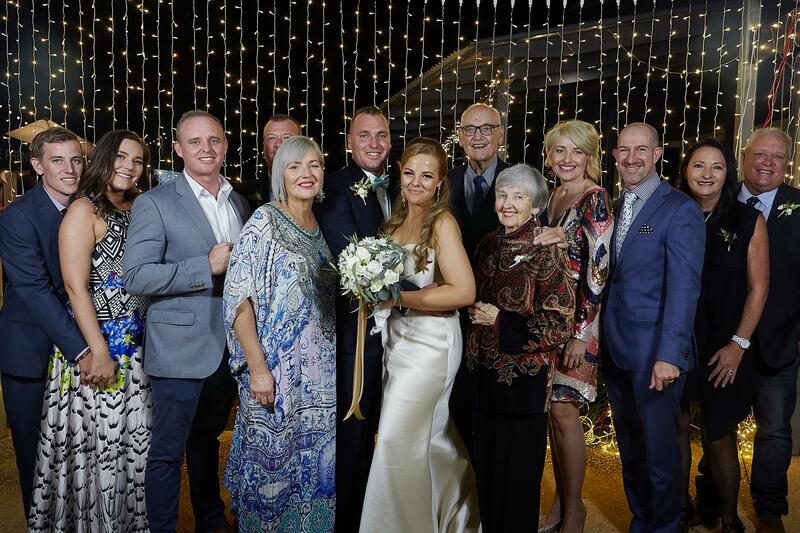 Many say they would rather buy a car or put the money towards a mortgage – I totally get that – but a wedding is a once (for most) in a lifetime opportunity to make a sacred commitment to your forever person with all your favourite people, and to treat everyone you love to a day & night to remember, forever. We wanted it all, so we just kept to a tight budget (some would say this is a big budget but we literally had everything we wanted). Whatever you can afford, I’m positive you can afford an amazing event. If you can plan and execute the wedding of your dreams with help from your friends and family, and without coordinator, I say do it! Dream, scheme, pin, and organise every last thing – it can be done if you are savvy and have the time and resources. But even I wish I had engaged someone like myself (clone machine please) at least for on-the-day to take the pressure off my lovely bridesmaids. I had to take 2 months off work to make it happen also, which wasn’t in my budget, now I think of it. 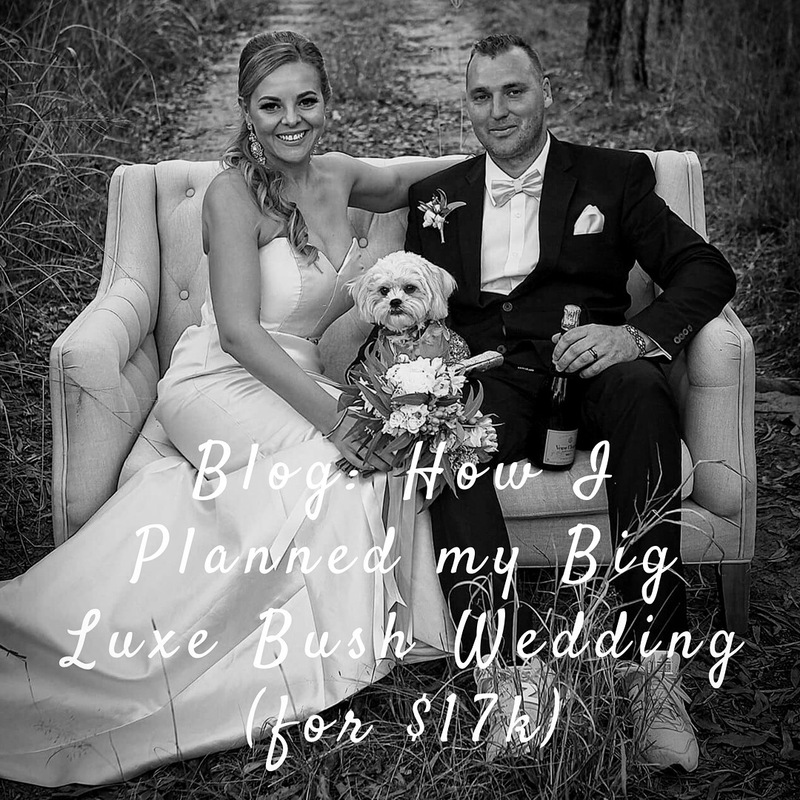 So now, for those of you interested in how I pulled off my 160 (156) person wedding, with (nearly) all of my wishes for about $17,000, in style, comfort, deliciousness and fun for everyone, here’s how! The BAR: $4,500 The biggest expense. Our friends like to drink! Personally, I only drink quality wine and spirits (yea I’m a snob). It makes for more bearable hangovers and a more luxurious experience. Quality over quantity I say. In this case we had both. I wanted to spoil my guests – and myself of course. Hubby is an amazing artist so we approached our favourite beer company to see if they wanted to do a trade – and they did! So we scored 4 bartered kegs of everyone’s favourite beer, Stone & Wood (saving us about $1200). We bought a few cartons of mid-strength and Golds for the olds; Provided three different cocktails in large vats, with choose-your-own-adventure crystal & glassware (I had so much fun collecting these, and I haven’t stopped); and we offered 3 mid-shelf wines – sparkling, white & red; and juice, sparkling H20, tea & coffee (don’t forget this DIY-ers) for the non-drinkers. I hired two of my lovely hospo friends (could have done with a third, poor things) who helped distribute all this glorious nectar and tidy up. Love! CATERING – STREET FOOD ALLY: $3,000 I have event managed several markets, so I’m in touch with Brisbane’s best street foodies. 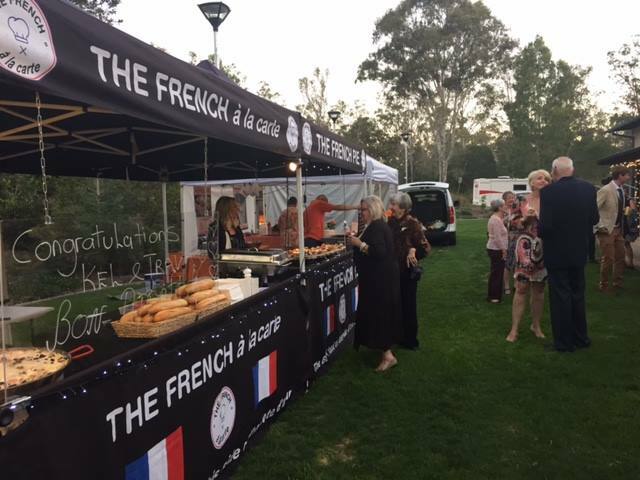 We hired 3 of my favourite stalls – French Pie, Brazilliyum & Dutch Treats. We printed menus based on their menus and guests could select whatever they wanted – as much as they wanted. Took a bit of coordinating but super delicious and fun. Go ahead steal my idea… Or hire me to do it for you! I’ve got lots of other yummy, affordable ideas! 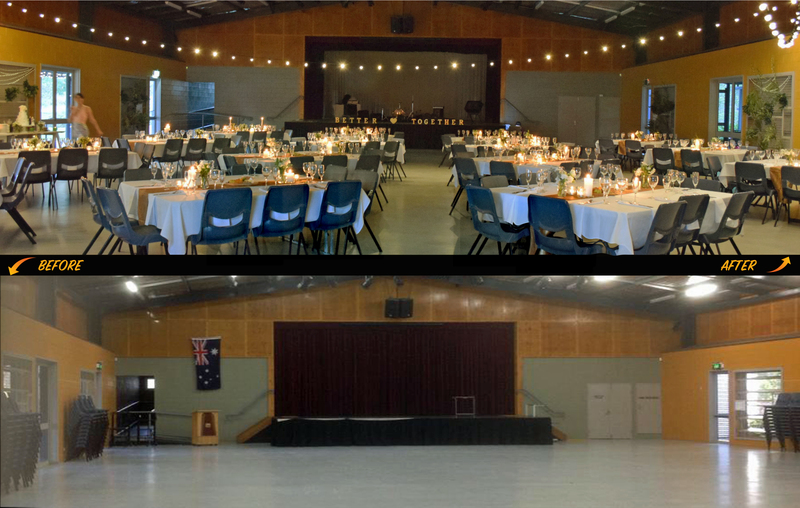 FURNITURE & TABLEWARE HIRE: $2000 The venue (ceremony on one side, street food on the other, reception in the middle) a school hall, had a fully functional kitchen, 300 new chairs and (almost) enough trestle tables. 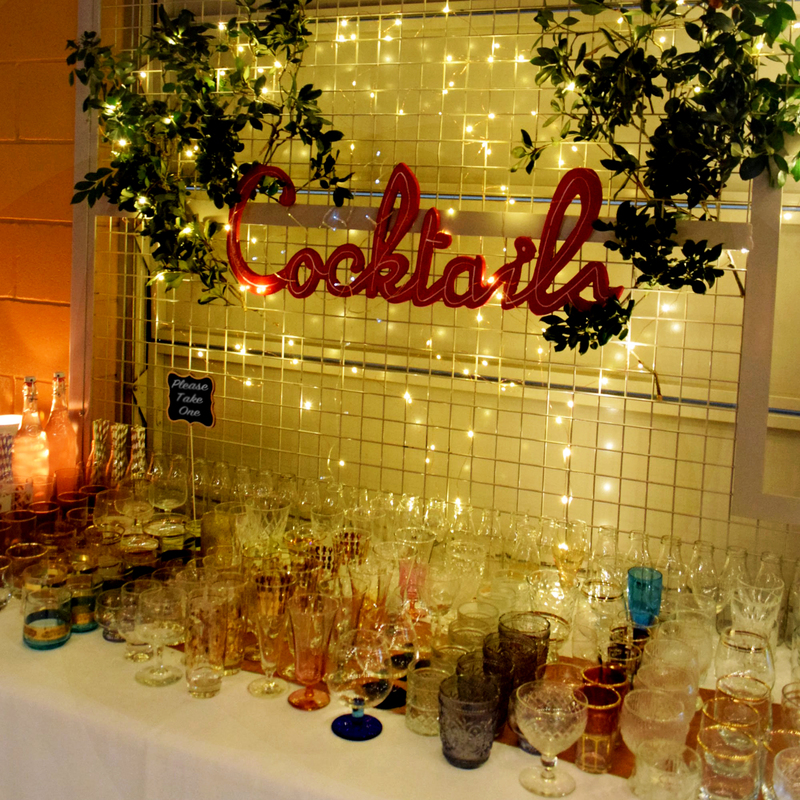 We hired linen, cutlery, crockery, glassware and a few extra tables. For the ceremony I hired 10 long bench seats, a sweet little signing table and included my own heirloom chairs. I also hired a gold lounge suite (3 and 2 seaters) for a comfy lounge area, and a linen-style love seat for our photos (see below). 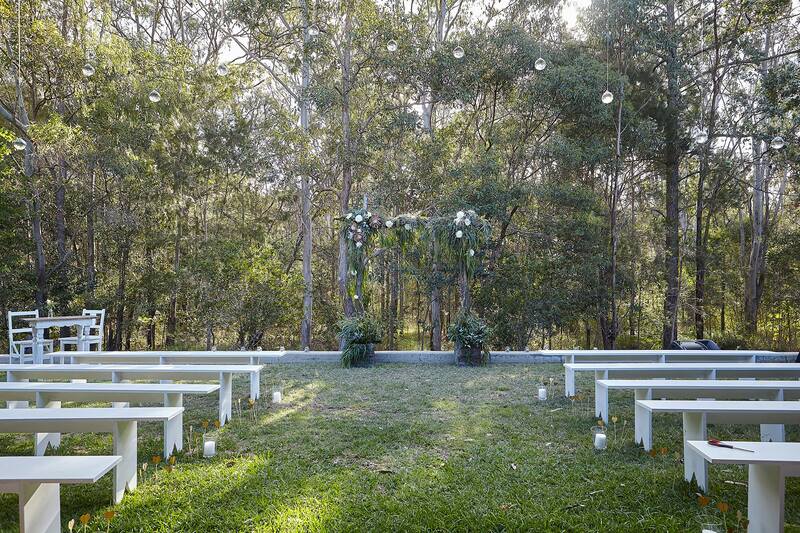 Both ceremony and reception hire stuffs were approx. $1000 each, including delivery. FLOWERS: $1,200 This is one item you cannot scrimp on, even though I’d have tripled the florals if I could have. 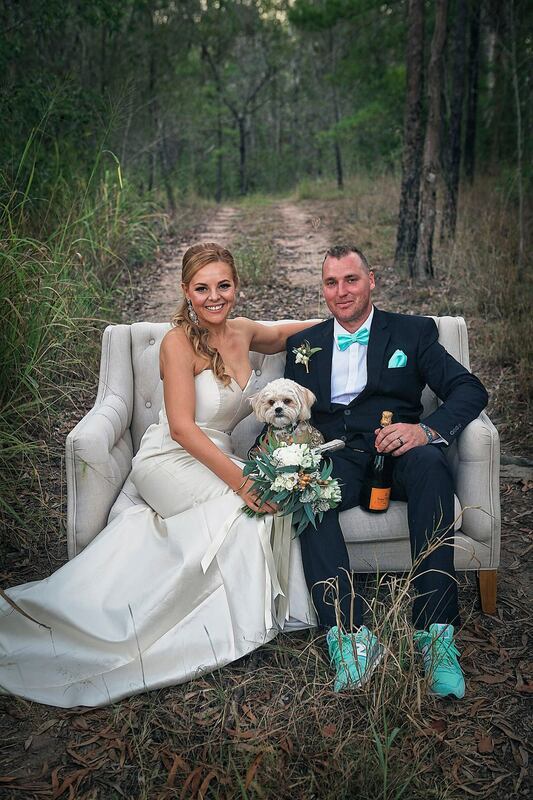 It’s a wedding thing, and they make all the difference. I only like real but fakies are getting better. It’s also amazing what you can do with some foraged greenery. Luckily for me a good friend is an incredible floral designer (@bramblehaus) and she looked after me. I easily could have spent more… I really wanted to… But I equally wanted to keep to budget. The room and bouquets looked incredible. I collected 50 jars in the months leading up. We had two posies on each of the 10 tables, 2 on the cake table and some scattered around the outside on dry bars and lounge area. Donated them to avBingo Hall.). 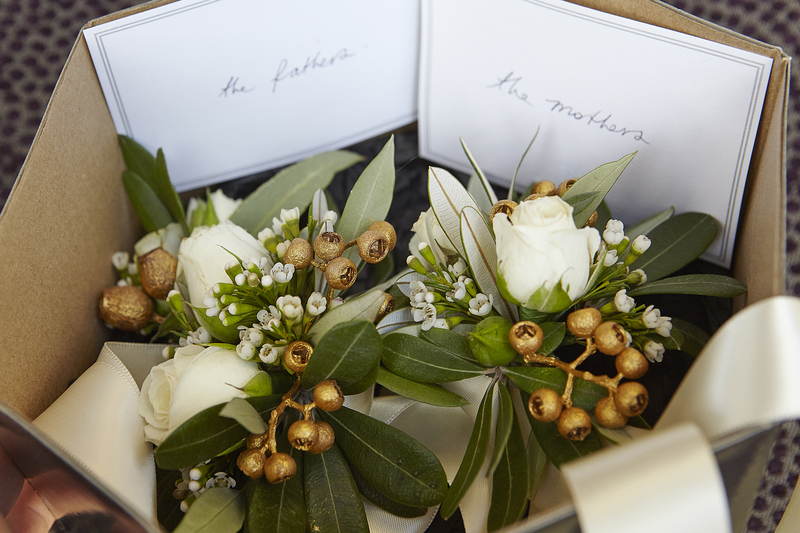 I wanted our parents, grandparents and step parents to feel special too so they all got button-holes and corsages. Another gorgeous friend foraged for greens and natives and lovingly beautified our DIY arbour (below). It was bliss. Bless. THE BAND: $1000 My favourite band AND DJ in the whole wide world (luckily Brisbane locals) KOOII and DJ Nick One played at my wedding. Kooii would not usually play for less than $3k (and their gigs are rare) but they happen to be my friends. 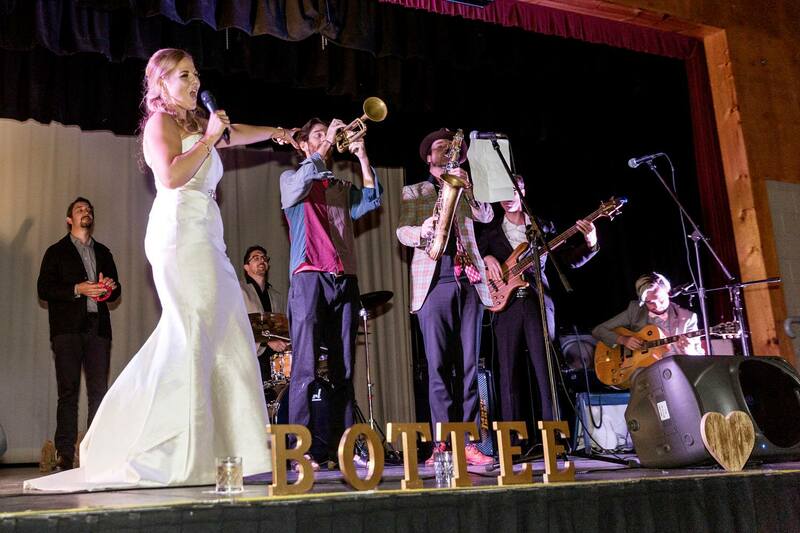 They even brought the PA and accompanied me in a song for my new husband (I was so sick I could hardly talk let alone sing, but the show must go on!). DJ Nick One performed as a wedding present. Oh and 3 members of Kooii (The Melotonins) sang me down the isle. Magic. Do you know some musicians or DJs that might gift or offer a discount? Give them room to say no (expect the best, plan for the worst:) and offer any bartering they might like! Just be fair, generous and kind. DECORATIONS: $2000 I decided to purchase 100M festoon lights and a LED curtain light outright ($1600) because I run many events where I knew they’d come in handy (check out DIY hire). Also, I love pretty things. I’d have easily spent more on other deco (around $800) was essentially candles, lanterns, pretty hanging things, gold stuff and luxury touches. Now I use these bits in my luxury picnics & proposals and for event hire and styling. You can sell these kinds of things on various FB groups, gumtree, ebay etc. after the affair too. DRESS: $1000 I had this made for me by an amazing local seamstress Susan Ogg. I purchased vintage silk from Melbourne (after finding out how silk is made!) 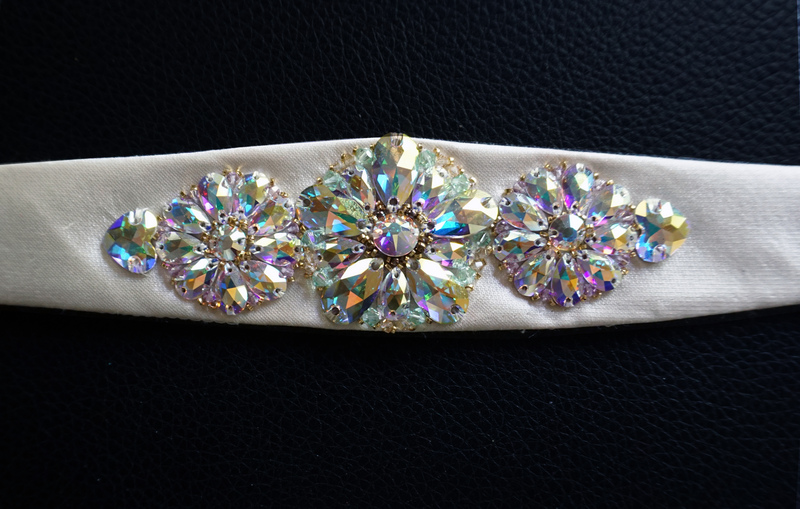 and swarovski buttons for the button-up and belt. A gorgeous talented friend made my amazing belt as a gift. CAKE: FREE A gift from my Mother-in-Law, who created this amazing, personal and crazy delicious cake with her incredible cake-designer friend Julie Gunthorpe, who was of course a treasured guest and is a new friend. INVITATIONS: $220 I designed them. Bought some end-of-run linen paper and got them printed, I even guillotined them myself. A bridesmaid and I gold-foiled them with my fandangle transfer machine (lucky she loves me, it took days). The cost was for laser printing and $120 for postage (I sent my Save the Dates by email). RSVPs were via my free “wedsite” (highly recommend this option). HAIR AND MAKEUP: $420 I just happen to be friends with the most amazing MUA possibly in Australia (no bias lol but on the real she’s made up Kim Kardashian and other huge names) and she did our makeup and helped with hair too for $70pp. My new Sister in Law (amazing hair stylist) did my hair and helped the girls with theirs also. VENUE: $550 I found a great hall just out of town that charged just $550 for the entire weekend – from Friday night for set-up to Sunday afternoon for pack-down. I originally had booked a more quaint country hall but they cancelled on me, this venue was available and worked so well. It was a bit of a distance from the city so I arranged busses for my guests from two locations. Country halls are a great idea for DIY weddings. They usually have a lot more space and facilities than parks and backyards, but make sure to ask all the right questions (what are the restrictions, neighbours, facilities). I know lots of venues like this – hit me up! I couldn’t have done it (not by a long shot) without my amazing friends and family helping with the intense set-up and pack-down. We made it fun, but it was big. On my ‘wedsite’ under ‘gifts’ I asked if people would like to gift us with their time or talents to make this big extravaganza shine. Highly recommend this as people love to help, and it really makes it a wonderful collaborative experience that brings you all closer together. Just make sure you have plenty of food and drink to offer. I did a BBQ breakfast on the Sunday for everyone (Ok, they cooked, I just delegated;). PHOTOGRAPHY: $600 Talking to friend Dane Beesley (shoots for Rolling Stone and stuff) at a party he mentioned he was thinking about getting into weddings. I proposed he shoot mine as a trial. I organised the shot list, people and locations, and he sent me digital copies of the flicks. I also asked my other photographer guests at the wedding to please bring their cameras and take some if they felt it, as a gift. I got very lucky – the extraordinary Luke Dyms and Julie Leaver got some incredible social and room shots. Blessed! I love looking back on how much fun everyone had. Another amazing friend (Jim Downey, brown velvet productions) surprised us by bringing his video gear. We now have all the speeches and performances captured forever too. We bought a remote-control for our camera and set up a DIY photobooth too (check the amaze backdrop, below). BUS SERVICE: $500 The cost was actually $1200 but I subtly asked my guests for a donation. I delegated collectors for each bus. If people didn’t have money no problem, it all helped. This option was much cheaper than cabs or ubers for my guests, so I didn’t feel too bad. The only difficulty was getting people on there at the end (midnight, if you’re wondering – I wanted to party up!). I also had a local uber take guests to their local accommodation (4 or so trips) I threw him $150. SIGNAGE $30: I printed 2 big A0s of the seating plan and had my artistic friends make up various signs on ply board. WHAT I WOULD HAVE DONE DIFFERENTLY: A few things I might have done differently in retrospect, but no biggie 1. I would have hired an extra bar server (the girls insisted that the two of them was fine, but they were run off their feet) 2. I would have checked out the lighting and AV before the event people were running around trying to get it working during the reception and we ended up just listening to video messages. 3. My sister in law was going to marry in September, which I wanted to do, she didn’t, and a few extra months planning would have been good. 6 months isn’t really enough time to DIY 4. I’d have hired an on-the-day coordinator so that my girls (bridal party, family) could have enjoyed themselves more (they say they did but I’d have liked them to relax more – they deserved to be spoiled after how they spoiled me). This coordinator could have helped tidy the boardroom which was set aside for breastfeeding mothers, but was a bombshell of make-up and clothes. Oh well. A FEW THINGS I COULDN’T HAVE DONE WITHOUT: Everything and everyone. All of the family and friends who showed up the night before and set everything up, then helped clean up afterwards, and ran crazy errands. The discounts and amazing skills offered by my floral friends, band KOOII and DJ Nick One, photographers – main guy Dane Beesley – and Luke Shirlaw, Joel and Julie, Bar servers Jo & Chay and the gorgeous foodies. My amazing bridal crew, who let me bounce ideas off of them all the way and helped with much of the planning and who threw me the most incredible surprise hens night. I’ll never forget anyone’s support. It makes my heart sing just thinking about it. I think it always will. THINGS WE SKIMPED ON: we decided against chair covers because, like who remembers chair covers (saved $320). We used the plates that the foodies use (ie cardboard), but set the table with napkins, cutlery and cute menus. I’m sure no one cared (saving $160). 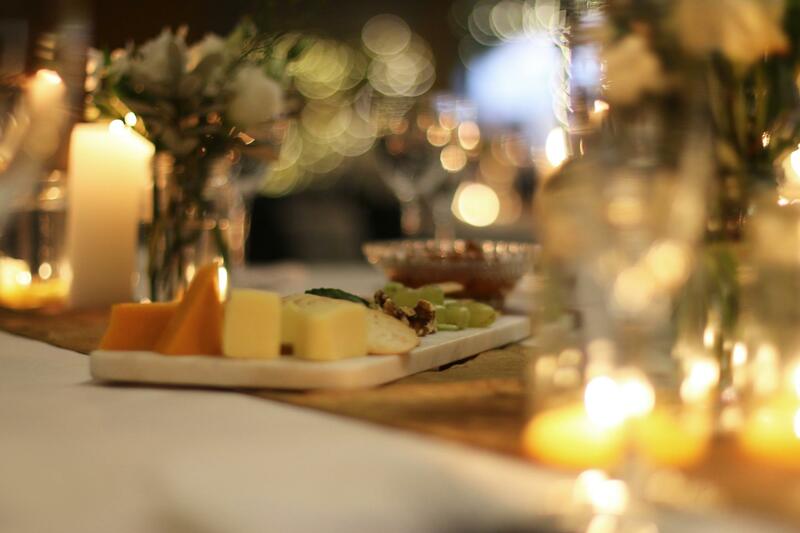 I would have liked gold cutlery and linen napkins, but for 160 guests it just wasn’t viable. Besides, now I can play with these items in my Luxury Picnics! We only invited partners that we know. This might seem harsh, but it was a sacrifice we had to make so we could have as many of our loves there as possible. When I had a decline, I offered some people people plus ones. Setting up took about 6 hours. I’d have liked to have had more time on the styling but, priorities. Our amazing cake was gifted. Our entree was cheese platters on each table, affordable and cute. I’d have liked more florals but it was fine and very lovely. We donated them all to an aged-care home the next day. FINAL ADVICE FOR DIY BRIDES: Take your time, if you don’t have time, hire help. Don’t feel obliged to invite people (OK, your Mum has to be invited but) it’s your day. Be diplomatic, but it should be how you feel and it and it should feel good. However, if you are relying on friends and family keep in mind you can’t push people too hard – it’s not worth the angst – you might have to let go some control. Shop around. Pick your wedding design (colours, style) early so you can start hunting for bits and getting the right supplies and services locked in (start your Pinterest now!). Budget for a day-of coordinator so everything runs smoothly and everyone can enjoy the day. If you can afford it, get as much help as you can. Things don’t go to plan sometimes – just know that everything will work out fine so long as you prepare best you can. Have a wet weather plan. Ask everyone for discounts (but don’t be annoying). Be polite. Enjoy the process. Breathe. Last weekend I attended the second inaugural First Coat Art and Music Festival in Toowoomba (Yes, Toowoomba, you snob;) about 120km west of Brisbane. I thought I knew what to expect after last year’s event – great art on big walls – but it was only the first year of the festival, after all. My expectations weren’t nearly as high as they’ll be next year. The caliber of street artists this year was as epic as last, but this year it seemed the whole town was in on it which made the experience so much cooler. Bakeries and cafes were supplying artists’ lunch; every hotel/motel provided rooms to travelling artists; there was a poster in just about every shop window; and the ‘country hospitality’ all-round delightful. Plus, the launch party was off the hook, boasting Brissy legends Regurgitator (who hadn’t performed in over 2 years) and a bunch of other great acts. What I especially enjoyed, alongside the amazing art, was seeing so many older locals and young families getting around to the sites – and absolutely loving it. Smiles and good vibes all round. It might be easy to assume, having lived in Brisbane for 15 years, that regional Toowoomba would be even more culturally dry than the state’s capital (n.b. Brisbane has bred some of the World’s best artists but most live elsewhere due to lack of opportunity). Turns out even rural Queensland has adopted the modern world’s approach to street art, openly and organically – without the need to control the medium, size, content, audience etc., etc., like our Nanny-Council tends to do. I could rant here but that’s not going to help anyone and I have heard whispers of change, though not for the first time. Let’s just say I’ve found it frustrating in the past seeking (not necessarily monetary) support from BCC for cultural programs involving anything that might be linked to graffiti – or underground music for that matter. It’s frustrating especially as public art (of varying forms) has clearly had great economic, community and cultural identity benefits for many other cities, world over. Here, in First Coat we have a great example of a viable arts program that doesn’t cost much and creates so much joy (which should be enough) as well as great economic benefit (tourism, retail, jobs) for the community. I’ve been in discussion with a few Brissy art champions for a while, regarding a mural festival for Brisbane, but I’m not willing to battle Council anymore so we’ll see – stay tuned! Anyway, I had so much fun at First Coat I thought I’d write a little shout out. I’m so excited to have a weekend destination, so close, with so much to see and do. I never considered Toowoomba much before. But with it’s beautiful heritage buildings, markets, galleries, parks and gardens, good coffee (didn’t have a bad one all weekend) and now world-class street art around every corner – in hidden alleyways, car parks, and just about every big (non-heritage) wall in town – it’s definitely worth the easy hour and a half drive from Brisbane. Props to Festival Coordinator Grace Dewar, extended First Coat and Kontraband crew, the 20 amazing artists, and the City (according to Wikipedia) of Toowoomba, you should all be very proud! Drapl & Treazy. Flix can’t do justice – get to 5 mill Street and see this multi-dimensional peice for yourself. Drapl & Treazy raised $400 for important work in the Amazon. Collaborative Visionary Leaders – holding the flame and sharing the warmth. For this blog I have focused on the role of visionaries as leaders within collaborative environments, particularly visionaries of creative and community based projects where there is sometimes little or no direct financial remuneration. Using collaboration to grow a person’s vision obviously requires good leadership; and this can be the case with shared vision too. In my opinion, good collaborative leaders are often skilled and passionate visionaries. In my experience a good visionary leader (a skilled ideas person) needs to passionately believe in their vision but be open to the creative process, be self-interested but fair and transparent, and, in the case of collaborative leadership, should be skilled at creating space for sharing and providing and receiving support. I have also realised good leadership needs (not only deserves) rewarding, whether financial or otherwise – it’s only human. I have broken down some of my experiences and lessons from several collaborative projects where I have held a visionary and or leadership role. 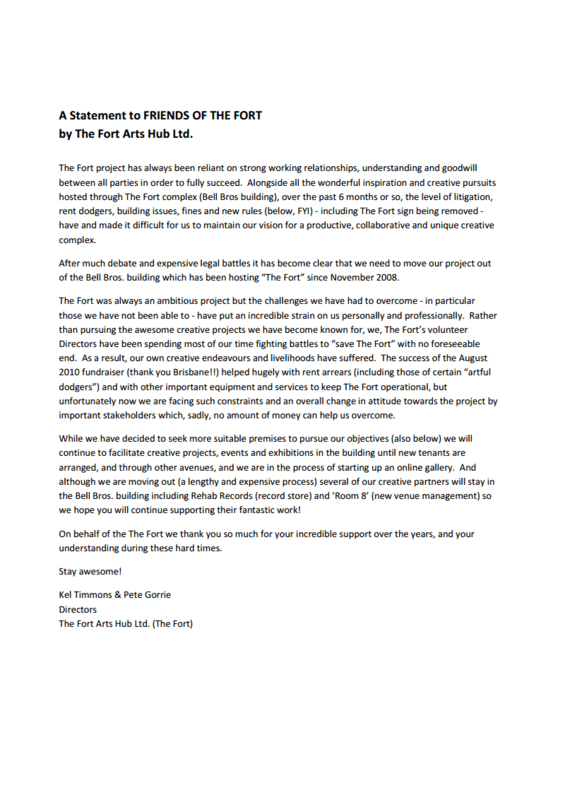 To start with, the largest and most complex collaborative project I have been part of to date, The Fort Arts Hub (The Fort). In 2008, my partner at the time (Pete Gorrie) and I started a very special arts project aimed at fostering creative projects, businesses and innovation through collaboration and exchange, on a large scale. The concept was a one-stop-shop of creative services, a centre for developing and presenting art independently (no Govt. 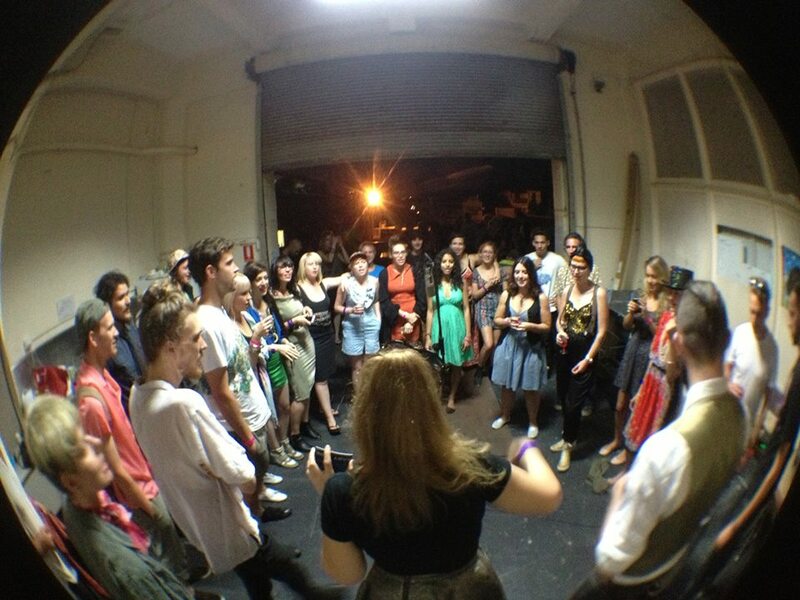 support/criteria) hosted within the beautiful Bell Bros. Building (1000m2) in Fortitude Valley. By the end of 2011, around the time of it’s unfortunate demise (see attached statement at the end of the post). The Fort had several thriving creative spaces and businesses including an art gallery, music and art supply shop, artist studios, designer suites (graphic and fashion), a film and photography studio, a state-of-the-art recording studio, a community function and concert space and more. How did we do it? You can be sure it wasn’t alone! Pete and I developed our vision, measured its viability (best we could), then sought about engaging others keen to share in and contribute to manifesting it (through leasing and sub-leasing spaces, joining our NPO, partnerships and sponsorships). My ambitious, perhaps slightly naive notion in the beginning was that the two of us (and our growing team) would develop the concept and systems for implementation then hand it (the vision) over to a non-hierarchical, ever growing body of equally excited individuals who would all do their part to realise the collective vision and their own, and we would all live happily ever after in a free-thinking, democratic and financially viable creative heaven. 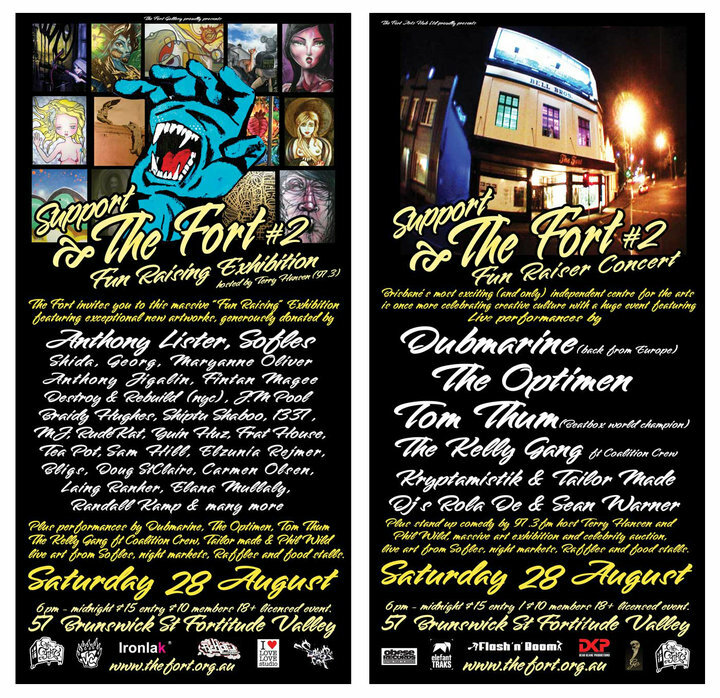 For the most part it worked (believe it or not) but what I did learn is that big creative, community and collaborative visions like The Fort need visionary leaders to hold focus through the creative process, and inspire and motivate collaborators to pursue the vision. Perhaps I was so caught up in creating a completely new blueprint for collaboration I convinced myself that management or anything slightly hierarchical was unnecessary for this project. Profit-share is a viable and wonderful business concept but I do see the importance (for the vision) of people being paid and appreciated fairly for their work (what is fair? That’s another blog, but on a side note, over the years I have noted a recurrent theme with creative collaborations, in Brisbane at least, that nobody gets paid until everybody does). In retrospect, if I had built greater self-interest into my vision for The Fort I might have made a better leader, instead of becoming a somewhat overworked and underpaid benevolent dictator out of necessity. I didn’t want to be the “boss” (especially when some people didn’t think I should) of such a huge collaborative project (not without pay) besides at the time I thought it was important that everyone felt equally integral to maintaining The Fort vision. Plus I had my own creative business to develop and I knew there was very little money to throw at this role with no time to properly develop it. I now realise I also didn’t value myself properly – the things we learn! Everyone was very busy with their own massive contribution – running creative businesses and collaborating amongst each other – and it became clear The Fort vision and its ambitious objectives could not be safely managed by the group mind, at least at first, and though roles were democratically delegated (and everyone was amazing) without a designated leader decisions took too long and I personally felt the vision for the long-term (5-10 years) project could have got distorted. So I stepped up and really started learn how to collaborate and engage in this environment. I worked harder to understand team members’, volunteers’, supporters’ and clients’ needs and interests, and together we achieved something truly astonishing. As the project grew so too did my understanding of the importance of good leadership and its role in collaborative projects. The deep end is where we really learn to swim. I may not have earned much money as a visionary of The Fort but the experience and respect I gained over those 3 years co-delivering the project will remain invaluable for the rest of my life. Hundreds of successful creative projects came out The Fort, and that still gives me joy. In this way it was a great success. Since The Fort I have continued to coordinate and collaborate on many creative projects as a freelance PR consultant, and as a singer and manager of soul outfit Bankrupt Billionaires. 1. Inspire others with your passion. True passion is contagious. 2. Listen closely to others and develop a culture of sharing – particularly ideas and expectations. 3. Remember (visionaries) it was your idea – don’t expect others to share the workload straight away, especially without pay – but you can try! If your idea is good, and you are open to ideas for manifesting it collaboratively, help (and money) will come! 4. People have reasons for wanting to work with you. Don’t be too proud. Find out what people get from supporting your vision, and nurture and honour that. 5. Stay true to yourself and your vision but believe in other people. There are a lot of amazing people out there. Exchange through collaboration could turn your great idea into something mind-blowing. People love helping. It’s what we do. When people feel a part of something special, amazing things happen. Spontaneous collaboration. We (that’s me front and centre) rounded up 20+ singers at a festival recently and recorded impromptu choir vocals for our upcoming album. The love was flowing. The last collaborative project I’m going to discuss is BRIS BEST FEST, a community event that featured live music and art, an art exhibition and food and market stalls, held in a car park and adjoining building in West End, in July this year. The idea came about after I was approached by a young artist to help him get permission to paint a privately owned wall. Around this time I was organising a group exhibition elsewhere. At a meeting with the building owners it struck me – all these world-class Brisbane artists wanted to paint a huge collaborative mural on a building owned by community-minded property developers (ARIA), the wall is attached to an art gallery with a cool owner, there’s a huge car park big enough for a stage and stalls, I know lots of people… And so it was. Once we convinced ARIA to provide the space, myself, David Don (the young artist) and James Thompson (gallery owner) got to work organising our mini-festival featuring the best Brisbane talent we know, with 6 weeks to organise and less than $600 budget (all our monies pooled together). Collaboratively we raised nearly $2000 for homeless youth (would have been more without rain), artists were paid, and everyone, volunteers and guest alike, had an amazing time. Over the years I have realised that people love to support and get involved in good things – such as events that are socially responsible, fun and well organised. Most people don’t have time to develop community projects but there are so many people in Brisbane with big hearts that are eager to get involved and support – they just need leaders with strong visions (refer point 1.). My role in this huge collaborative effort was to help organise and oversee the event, incite passion and support, and make sure every single person involved (over 50 volunteers and artists) felt valued and supported. The festival would have suffered without even one of these people, yet many of the lovely volunteers expressed overflowing gratitude to me for the opportunity, I could have cried, and I did. Admittedly I can be quite precious with my creative visions (which nearly always use collaboration) but I have learned to balance this with other peoples’ needs and I consider this (doing it my way) in the self-interest equation. The passion I have for rolling out the projects I have envisioned has always overridden the need for great financial recompense, as I am often hugely satisfied in other ways – experience, self-worth, relationships. Next step is finding new ways to make all these fantastic ideas and collaborations more and more financially viable, for myself and my fellow collaborators. Surely money couldn’t hurt the collaborative experience, could it?